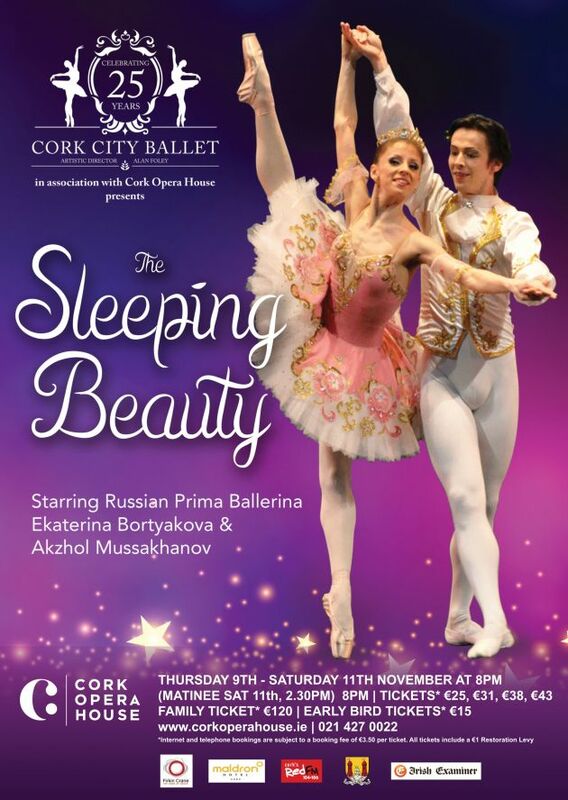 Cork City Ballet presents Tchaikovsky’s masterpiece – The Sleeping Beauty at the Cork Opera House from Thursday 9th – Saturday 11th November (with a matinee on Saturday at 2.30 pm) to celebrate the company’s 25th Anniversary. Directed by CCB’s Artistic Director Alan Foley, and choreographed by our chief choreographer Yury Demakov, The Sleeping Beauty reawakens the magic of the world’s favourite fairy-tale in an enchanted world of castles and curses, forests and fairies. Once upon a time, in a land far, far away, Princess Aurora lived in a castle where fairies bestowed her with gifts of joy, wit, generosity, temperament, purity and of course beauty. However, the wicked Fairy Carabosse put a curse on Aurora; to prick her finger and die on her 16th birthday. But the Lilac Fairy cast a spell putting her to sleep for a hundred years, only to be awoken by the kiss of a Prince. The leading role of Princess Aurora will be danced by the very beautiful Ekaterina Bortyakova, and her Prince will be her husband Akzhol Mussakhanov, both principal dancers with the Moscow State Ballet, and they will be joined by soloists and a full corps de ballet from Cork City Ballet. Speaking at the recent launch of this production, Artistic Director Alan Foley said, “I am delighted that The Sleeping Beauty, with its beautiful score, magnificent choreography and stunning sets and costumes is in the repertoire for 2017, marking Cork City Ballet’s 25th year in existence.